Making out a strong case, Prime Minister Modi said Indian shipping sector is ready for "a long haul" and called upon investors not to miss out on "the pleasant journey and great destination". Pitching for making the country's 7,500-km long coastline an "engine of growth", Prime Minister Narendra Modi on Thursday said India wants to mobilise Rs 1 lakh crore investment to enable port development and invited global community to invest. 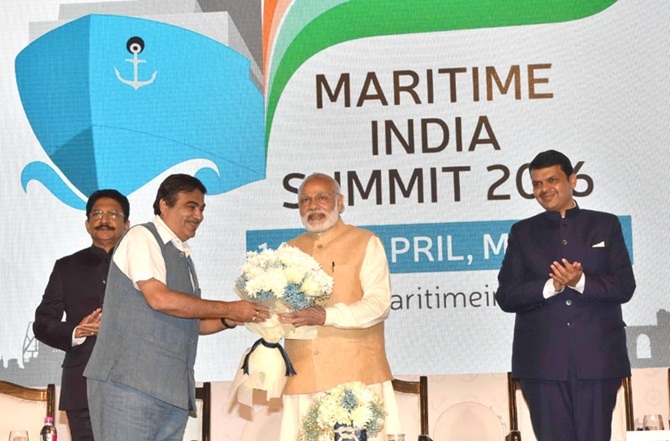 Inaugurating the first Maritime India Summit (MIS) in Mumbai, Modi said it is the "right time" to come and better through the "sea route". "Our vision is to increase port capacity from 1,400 million tonnes to 3,000 million tonnes by 2025. We want to mobilise an investment of Rs 1 lakh crore in the port sector to enable this growth," the Prime Minister said after opening the MIS 2016. India, according to Modi, plans to add five new ports to meet increasing demand of Exim trade, which is expected to rise in line with the fast-growing Indian economy. New ports are also being developed by several coastal states of India. Making out a strong case, the Prime Minister said Indian shipping sector is ready for "a long haul" and called upon investors not to miss out on "the pleasant journey and great destination". Modi added: "It is even better time to come through the sea route... Once you are here, I assure you that I will personally hold your hands to see that your berthing is safe, secure and satisfactory." Paying tribute to Baba Saheb Bhim Rao Amdedkar on his 125th birth anniversary, Modi said the architect of India's Constitution is also the architect of the country's water and river navigation policy. Elaborating on the government's plans for the sector, Modi referred to the shipping ministry showcasing some 250 projects with investment opportunity in the maritime sector. These projects include various infrastructure development opportunities in 12 major ports, projects in eight maritime states and other agencies, of which over 100 projects have been identified under the ambitious Sagarmala programme. "With more than 14,000 kilometers of navigable inland waterways in the country, there is tremendous potential for development in this sector. My government is committed to integration in infrastructure. We are also committed to creating an enabling environment for investors and facilitating investments with an open mind," he added. On the need for collaboration, the Prime Minister said it not just creates and facilitates economic activity, but connects countries and civilisations. He termed it as "the cleanest and cheapest carrier" of global trade. "However, in this sector, no country can achieve the desired results in isolation. Nations have to collaborate to realise this potential and overcome challenges in this sector. The objective of this summit is to provide a platform and a forum for such cooperation," he stressed. "India has had a glorious maritime history. We are on the path of shaping an even better maritime future." The overriding theme in Modi's speech was to modernize India's ports and integrate them with special economic zones, port-based smart cities, industrial parks, warehouses, logistics parks and transport corridors. Seeking partnership, Modi made a specific reference to rating agency Moody's recent appreciation of the Make in India initiative. "We have done a lot of corrections on the front of ease of doing business. We have jumped 12 ranks in the World Bank’s ranking," the Prime Minister said, adding India has liberalised the licensing regime, including that of defence and ship-building sectors. Backing up his assertions, he said FDI inflows have gone up by 44 per cent since his government took over. "In fact, 2015-16 has seen the highest ever FDI inflow into India," Modi noted. In 2015, India saw the highest-ever volume of cargo handled by its major ports. Port efficiency parameters have improved and India notched up fastest average turnaround time in ports in the same year, he added. "In the last two years, our major ports have added 165 million tonnes of capacity with record addition each year. 94 million tonne capacity was added by these ports in 2015-16 alone, which is the highest ever," he said. The Prime Minister said the shipping ministry is showcasing about 250 projects with investment opportunity in the maritime sector. These projects include infrastructure development opportunities in 12 major Ports, projects in eight maritime states and other agencies. The initiatives would create employment opportunities of approximately 10 million jobs over the next 10 years, which includes 4 million direct and 6 million indirect jobs, he added. Modi also touched upon more than 14,000 kilometers of navigable inland waterways in the country with tremendous potential. Speaking at the same event, Union Shipping and Ports Minister Nitin Gadkari said: We've launched Project Unnati for major ports and already, there has been a 30 per cent increase in efficiency... We plan to double the port capacity in the next 10 years, which will include building 6-8 major ports at an investment of Rs 50,000 crore." Plans are also afoot for developing 40 coastal SEZs which would create 1 lakh jobs. Kim Young Suk, Minister of Oceans and Fisheries, South Korea, called for tapping similarities of both India and South Korea. "India is well endowed with growth through oceans and South Korea is well positioned to offer its technology and expertise to support India," Kim added. Governor of Maharashtra K Vidyasagar Rao, Chief Minister Devendra Fadnavis, Gujarat Chief Minister Anandiben Patel and Secretary General of IMO, Kitack Lim, were present.